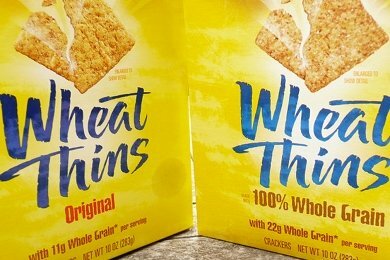 Last week, Snack Girl posted Whole Grain vs Original Wheat Thins and pointed out the differences between 100% Whole Grain Wheat Thins and Original Wheat Thins. If you read the post, you read that I had contacted Kraft regarding the fact that the 100% Whole Grain version didn't look as healthy as the original. Well, it only took them 5 days to get back to me and I actually spoke to a company representative, Basil Maglaris. I have posted his e-mail below. I realize that some of my readers might be wondering why I even talk to major food corporations since they create stuff like the McDonald's Frappe. BUT, I think that they are here to stay and that we should engage them in a dialogue to influence them to produce healthier products. For example, Michael Pollan slammed Whole Foods. Then, he met with their CEO and their meeting seemed to produce results. Here is a letter that Pollan sent to Whole Foods: Michael Pollan's Second Letter To Whole Foods. So, I give credit to Kraft for engaging a critic and creating a dialogue. Thanks! Finally, if any of you have questions for Basil regarding the Wheat Thins, I will happily get him to answer them and post his response here on Snack Girl. We began improving several of our Wheat Thins varieties in August 2009 and your box of Original Wheat Thins is one of them – we removed the high fructose corn syrup, reduced the sodium by 10%, and more than doubled the whole grain content from 5g to 11g per serving. The current “100% Whole Grain” Wheat Thins hasn’t undergone some of the same recipe changes so when you compare the two products, you’re correct that there are noticeable differences in their recipes. As you’ve heard, our plans are to increase the whole grain content of Original Wheat Thins to 100% whole grain. When we make the transition to 100% whole grain for Original Wheat Thins, we’ll be discontinuing the “100% Whole Grain” Wheat Thins you see on shelf today, along with its old recipe. I’m happy to address your question on fiber as well. When we release our new Original Wheat Thins with 100% whole grain, it will have 3g fiber per serving. Our current “100% Whole Grain” Wheat Thins on shelf was introduced several years ago and since then the technology for measuring fiber content has advanced. The Whole Grains Council confirms that 22g of whole grain wheat delivers 3g of fiber. Our new Original Wheat Thins will reflect that. Many Americans are falling far short of the minimum three recommended servings of whole grains each day. We feel we’re offering many ways for people to get more whole grain in their diets while enjoying the foods they already love like Wheat Thins. Thank you again for sharing your concerns and we hope you continue to enjoy Wheat Thins in the future. Have any questions for Basil? Post them here!! Awesome! Good to know there is a dialogue and that people are actually listening to each other. We often forget in this fast paced world that things take time to change. Packaging has to be remade, factories have to be re-tooled, recipes have to be reformulated and tested. We forget that when this is on such a HUGE scale, it can take years - often more time than we would like. A dialogue is the first step. Thanks!! Smart companies are waking up. Companies used to laugh at blogs until they realized how many people are getting their information from them now. Many blogs are becoming just as influential as traditional media outlets, and smart companies will pay attention. So congrats Snack Girl! The fact that so many companies are willing to respond to you when you question them is proof of how successful your blog has become! Paul - Thanks so much for saying I am successful - I am certainly working on it. I think that bloggers have a say and as long as we are professional - we can influence public policy, food manufacturers, elections, etc. I try really hard to be accurate as I can without the use of a newsroom. Sadly, I don't know if it's reasonable to try to get companies to discard all unhealthy choices. There will always be a market for such products. Personally, I don't even mind if a company has some bad choices, as long as they offer good choices to those of us who want them. Until recently though, there were no good choices at McDonald's, including their salads! It was through the efforts of blogs and consumers like this, though, that started getting fast food joints to start offering things like apples instead of fries, milk instead of soda, etc. I like this blog because it informs on things that appear healthy, but really aren't. It alerts me to super-unwise choices at restaurants. It gives me fun and interesting ideas to try. And maybe, just maybe, it generates the kind of buzz needed so that companies will pay attention and pay more attention to better ingredients rather than just spending all their money on marketing. When you accomplish all that, you are most certainly successful. Thanks so much for writing about The Whole Grains Council! That's great Kraft responded! I have to say I bought a box of Wheat thins a few months ago and they tasted really sweet. Not like a cracker at all and I figured the recipe had changed. I am not fond of the new taste, much prefer triscuits. Um... I think you might have missed the story here. In his reply, Mr. Maglaris told you that the product Kraft markets as "Original" Wheat Thins is actually a new type of cracker with significant changes compared to the original recipe. In other words, "Original" doesn't mean original. Isn't that a glaring example of the deceptive marketing which is at the root of the problem? Personally, I don't mind that big food companies produce unhealthy products. I can make smart choices as long as the products are labeled correctly. I do mind, however, when companies lie to me and say something is organic when it is not, or say something is low-fat when it is not. In this case, the lie of "Original" may not have adverse health consequences, but it demonstrates how untrustworthy these companies are -- they always choose market advantage over truth. I'd be curious to know what Mr. Maglaris has to say about this, because my perception is that he and other Kraft executives don't have a clue how their products are perceived by the public. They live in a world where words mean whatever their legal department says they mean, and then are surprised when the public comes to regard them as lying bastards. My take on all this is that when I bought the "Original" wheat thins that's what I expected to be eating. The "new and improved" ones taste like a bland, unsalted soft cracker, more on the idea of a low-sodium Ritz cracker, just shaped differently. If I'd wanted whole grain Wheat Thins I'd have opted for that box rather than the "original" flavor! I totally agree with truth in advertising, and if the box is marked "Original" it should BE "Original". Original Wheat Thins are what people know and love, leave them alone! Have to agree with Madelyn - my kids noticed first that the crackers looked different (nine holes in them - unlike the pic on the box). Then we tasted them - they didn't crunch, they were soft and did not taste anything like the original wheat thins. Big bummer. I am in agreement with Jodi-O and her children. We noticed changes in taste and look (nine holes) upon opening our latest box of "Original Wheat Thins." Just called the 800 number, they acknowledged recipe changes noted above, but had nothing to say about the change in look. The NEW Original Wheat Thins are not as firm, therefore more susceptible to breaking when used for dips. I prefer the former taste, but am pleased that the new version is healthier. I just think that the company should acknowledge on packaging when they change a recipe, not try to pass it off as "original." I just bought a box of original wheat thins and hadn't had them since 2006. The new and improved original Wheat Thins are horrible. The taste and texture are completely different. I understand the health concerns, but the change made an entirely different product. These are not Wheat Thins. I am not liking these so called ORIGINAL Wheat Thins at all. Please bring back the real ORIGINAL ones they are much better. Guess I will havew to switch the kind of cracker I eat, plus if I choose to eat a healthier cracker I will buy a healthier cracker. now bring them back!!! I'm not a fan of these new original wheat thins either! Bring back the old one please! These "new"wheat thins are absolutely disgusting. Please bring the old ones back! I bought a box of Wheat Thins on a whim (not a regular staple in my diet). They were disappointing to say the least. Doughy and soft (like a stale box of WT's), bland and just not the same. Also disappointing is the "Original" on the package. Please bring back the good old crunch! The newer Formuation of wheat thins are sweeter than the wheat thins of old.....they are horrible....taste more like graham crackers than a wheat thin....in addition, the great texture of the older formulation as been lost.....so has my dedication to the brand......will be looking for a new favorite cracker! as, like New Coke" I will never be eating Wheat thins again.